For a brief moment, I felt as though I was lost in another time and place. Conversations held exclusively in Italian filled the room. Music streaming from Italy played on an iPhone. Hot espresso steeped out of the maker, warming a cold January morning. Taking a step through the Paoloni family residence, I might as well have been on another continent. 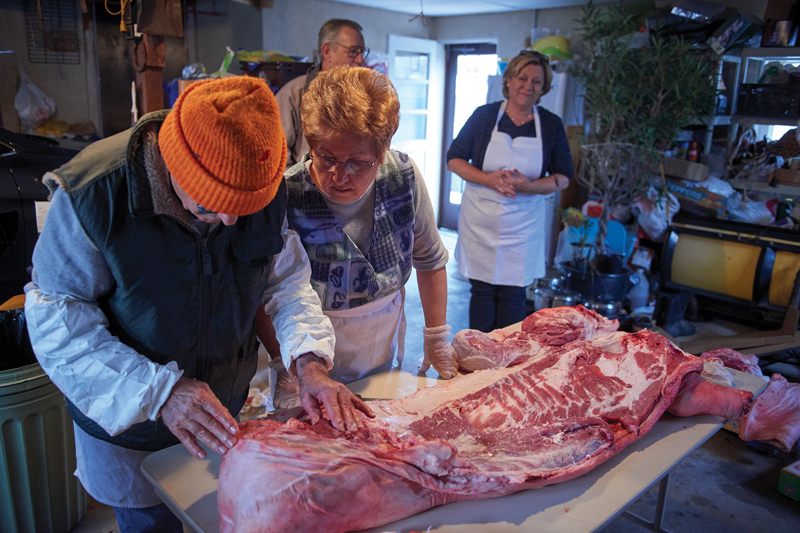 Close friends of mine had joined Mirella and Pietro Paoloni in their home on a number of occasions over the years to help them make their delicious sausages and cured meats. This year I was invited to join their tradition, which dates to 1974, the year they built their home after immigrating to the United States from Italy five years prior. Every winter since, their family has butchered as few as one and as many as four hogs to provide food throughout the year. 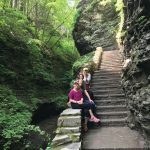 Their children and grandchildren often return to participate, carrying the tradition forward. 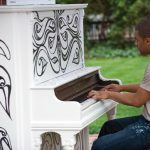 The process itself is beautiful and like nothing I’ve ever experienced. The air was crisp, a natural refrigerator perfect for keeping the 320-pound hog chilling in the garage. Pietro was well underway by the time I arrived at 7:30 a.m.
Mirella and Pietro are masters of their craft. To my eye, there was an enormous respect in how everyone involved handled the hog, as though it were still alive. 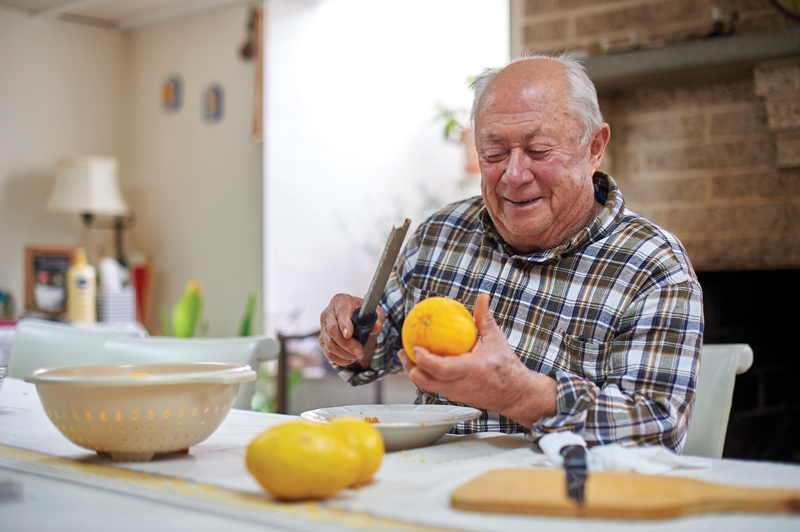 Pietro’s knife worked swiftly and intentionally, with delicate precision and care. His job was to butcher and prepare the meat for use in the kitchen and maximize what was available. 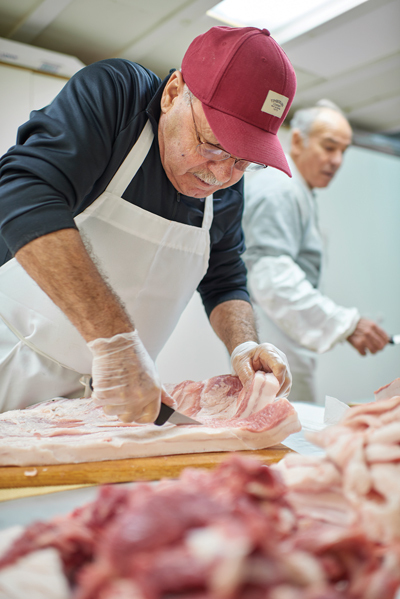 As he worked in the cold, familiar and unfamiliar cuts of meat started to appear. Once in the kitchen, Mirella’s expertise was at the helm, guiding them all. She knew how to make the best use of each cut and was processing the recipes in her head. 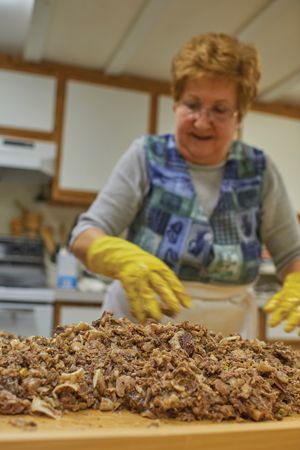 Mirella mentioned she wanted to try a new recipe from northern Italy using fat and vegetables to make sausage, something she had never tried in more than four decades of making sausage here in the United States. She’s still learning and is game for trying something new (or, in fact, quite old). 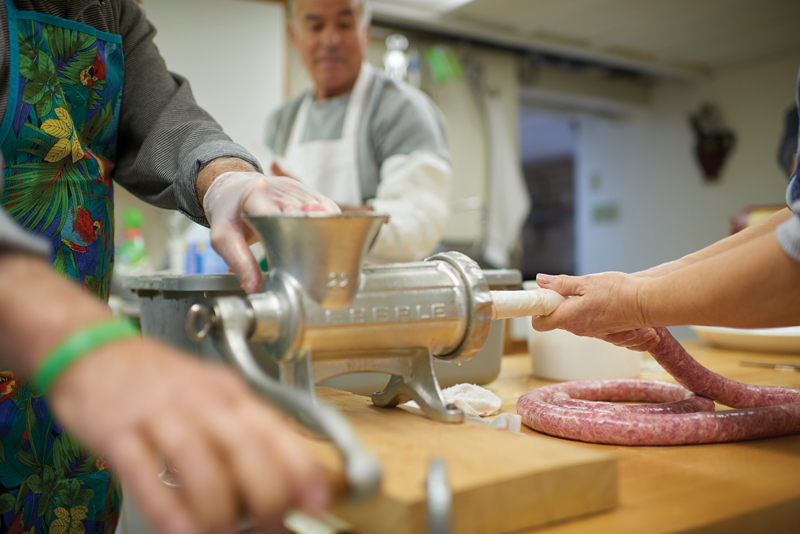 For measuring ingredients to mix with the sausage, weight is used instead of volume to ensure better accuracy. 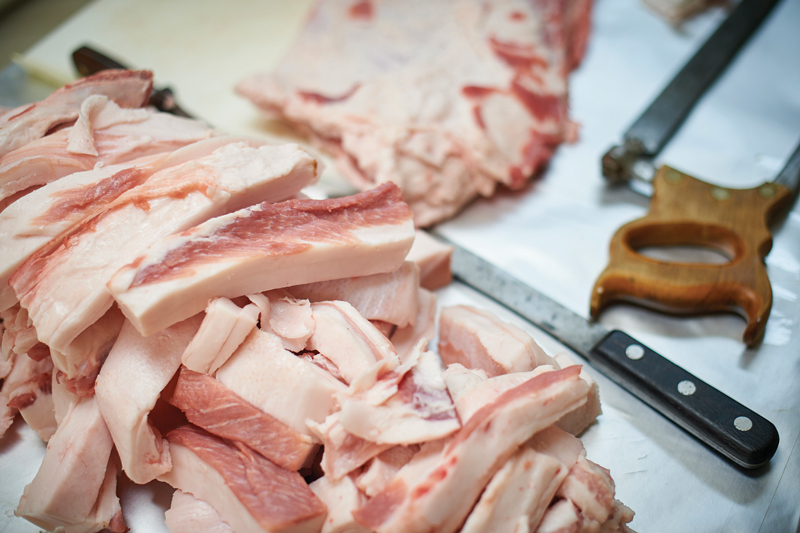 To calculate those numbers, the quantity of pork must first be weighed, so a bathroom scale is used (minus the weight of the person holding the container). 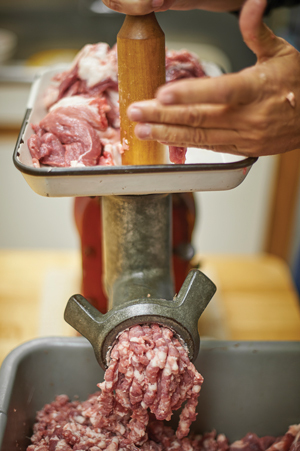 From there, sausage is ground into a finer consistency and fed into natural casings to make sausage. 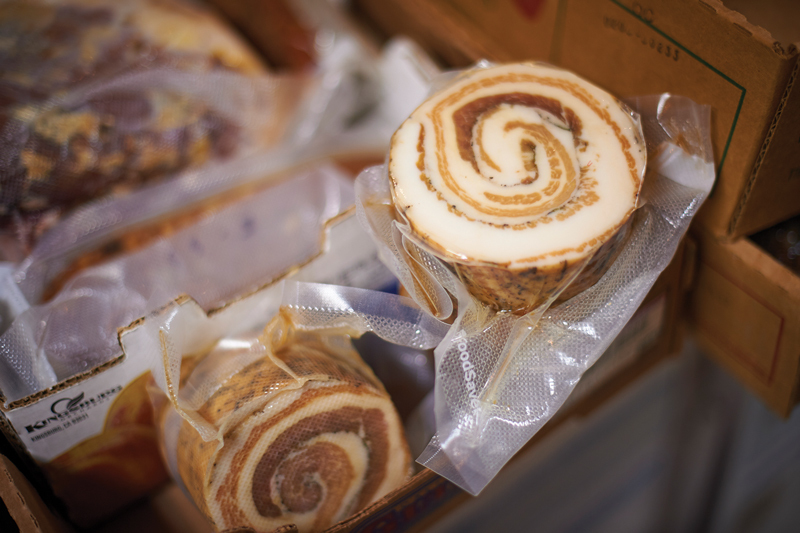 Once made, the sausage will hang for two weeks – depending on the weather – before being cooked or vacuum-packed and frozen. Actually, this was day two of the work, and it’s reserved for packaging sausage. The previous day was spent picking up the hog and letting it hang in the frigid garage to lower the temperature. Ribs are frozen on the third day, and on the last day, pork loin is washed, dried, seasoned with pepper, and sewn into mesh netting to hang. The salami takes two or three weeks to dry before being vacuum packaged. 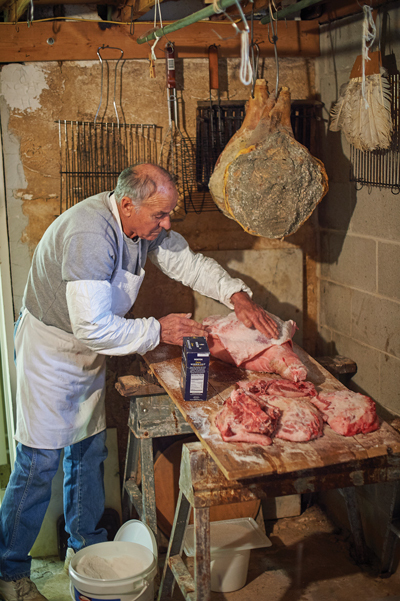 In making prosciutto and capicola, there are a number of methods for curing meats, typically either with chemicals, smoke or open air. When curing with salt, an ample amount of salt coats the ham to remove water by osmosis. This prevents microbial growth in a dehydrating environment, thereby both drying and preserving food. As the group works, collectively I’m told the word “salary” is derived from the word salt, or “salario,” as salt was once such a valuable commodity that it was used as currency. Without refrigeration, it becomes clear how necessary salt would be to survival, preserving food year-round. The prosciutto may cure for a year or more, and what’s left is a flavorful delicacy that’s dried but tender. Often, a white or gray mold will develop on the outside of the curing ham, which is actually desirable, acting as a protective barrier from harmful bacteria of a darker color. As I said before, nothing goes to waste, and head cheese is the perfect example of that. 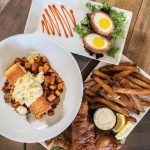 It’s quite similar to the Lancaster County tradition that is known as scrapple, though you can guess the main ingredient (it’s not cheese). Now, before I lose you, hear me out. It’s important to bear in mind there was a time when out of necessity you wouldn’t waste anything in order to provide for your family. Secondly, if you enjoy the taste and flavor of sausage, this is just as delicious and well-seasoned. Pietro and I cherry-picked pieces of hot, tender meat from the spread as Mirella worked. Call me adventurous – I love a crispy slice of scrapple – but this had remarkably better flavor. After we were chased away, the head cheese was added to the casing where it will congeal and be sliced for serving, having a shorter storage life than the rest of the sausage prepared. 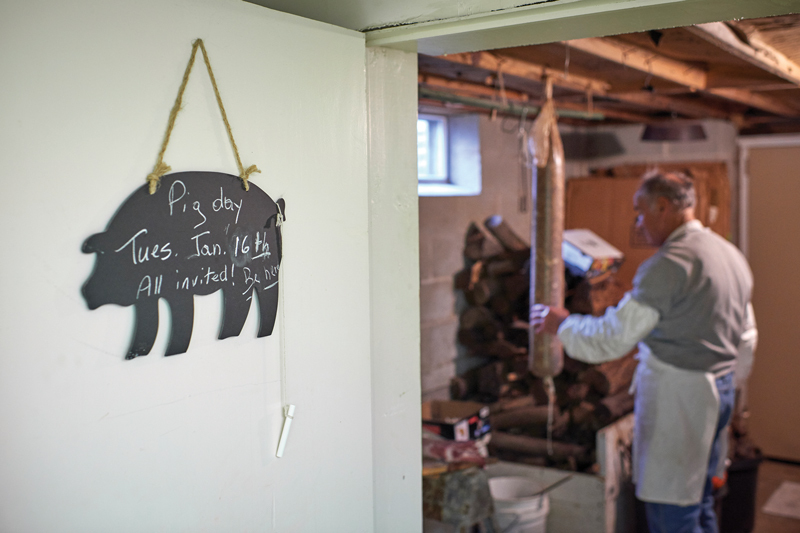 The Paolonis are highly selective about where they source each hog, a topic we discussed at length from how it was treated throughout its life and how it was handled at every step along the way. Not only is it an ethical concern, but it’s also a critical factor as to whether meat can be cured (especially when making prosciutto). It brings into question how we source our food, regardless of what it is. It’s prompted me to take a second look at excess and waste, proportions on the plate, and the amounts I consume. Recently, I came across a 20-year-old interview with my grandpa that I had written for a middle school assignment. It focused in part on his life during the Great Depression. He mentioned that his own granddaddy would butcher a hog and give meat to everyone in the family to help them along. I mentioned it to my grandmother, and she shared a similar experience. Each of her and my grandfather’s families butchered a hog every winter as a critical component to enduring the Great Depression. Availability and technology have certainly changed how society buys and sources food. We’re less self-reliant as technology and transportation have become globalized. Finding a wide variety of fresh foods from around the world is commonplace. A vegetarian lifestyle is easier to maintain with more food options not only at the grocery store but also in restaurants. Food transports us across places and time without having to go anywhere. Every culture has something beautiful to share. It was an honor to witness the Paolonis’ traditions come to life. I learned a great deal and have a deeper appreciation and connection to food thanks to them. In a sense, I spent a day in Italy, food as my passport, no flight required. We can learn a lot from one another – right in our own backyard – if we take a minute to slow down, listen and enjoy something that’s foreign to our taste buds. 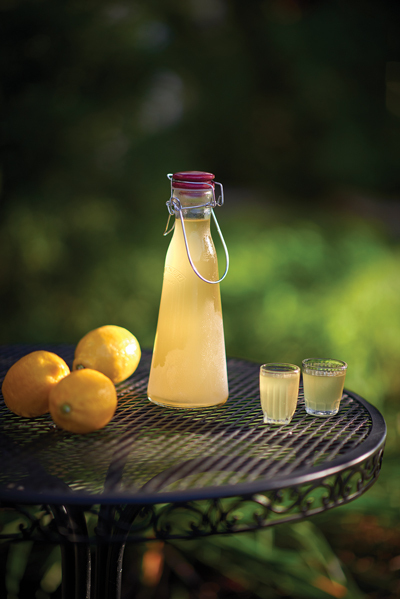 If you’re looking for a cool treat, limoncello and orangecello are two delicious drinks well worth the prep. Mirella and Pietro naturally make their own, and it does not disappoint. Of the two, limoncello is a bit more common. 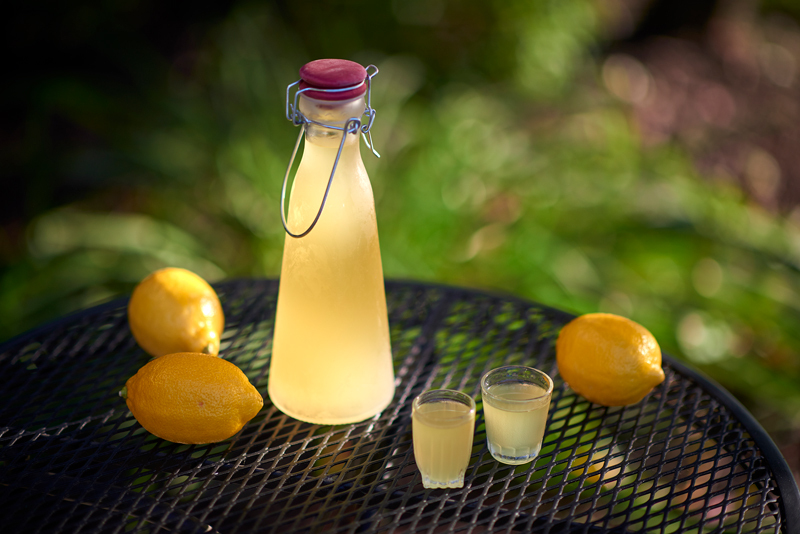 For those interested in making it, grain alcohol or vodka is infused with lemon zest. It’s then added to simple syrup, which is a mix of 50% sugar and 50% water, stirred in a saucepan until dissolved. You’ll need a microplane for zesting. (Note: avoid zesting the bitter white pith of a peel for better flavor.) For orangecello, simply replace lemons with navel oranges. If you’re feeling creative, an infused vanilla vodka could also be substituted for added depth. In my experience, limoncello serves best from the freezer.